This course explores fantasy literature written over the past 60 years with an examination of the works of six modern fantasy authors. The Modern Fantasy course provides a thoughtful sampling from the diverse world of fantasy in the post-Tolkien age. Fantasy literature has a long and robust history, of course, which is as long as the history of stories themselves, but the astonishing popular success of The Lord of the Rings led to a remarkable proliferation of fantasy storytelling that has only continued to grow over the last sixty years. The Modern Fantasy course is designed to explore some of the different frontiers of this fascinating literary landscape. Through careful readings of a mixture of books from different authors in different eras and with diverse approaches to fantasy, we will consider some of the ways in which writers of the last few generations have approached the fantastic. As we do, we will think about the purpose and the value of reading fantasy in the modern world, as well as the challenges of writing it. 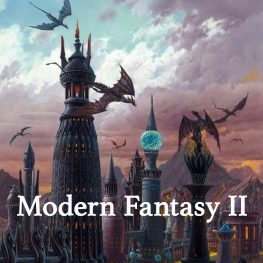 This semester’s course is called Modern Fantasy II, not because it has a prerequisite or because it is part of a linear sequence, but merely to indicate its separation from the earlier version of the course, which I taught back in the summer of 2012. Although the purpose of the class is the same, the books we will be reading are completely different. Students who enjoyed the first installment of this class are very welcome to take this second version as well! This semester, the class will begin with an examination of fantasy authors’ interactions with mythology and history. We will begin by reading Katharine Kerr’s exploration of Celtic tradition in Daggerspell. In The Furies of Calderon, Jim Butcher imagines a society that grew from the displacement of a Roman legion into a magical world, while in Hard Magic, Larry Correia re-imagines early twentieth-century America after the appearance of peculiar magical talents in certain individuals starting late in the nineteenth century. Finally, we will look at three very different and more independent subcreations in David Eddings’s Belgariad (of which we will read the first two volumes, Pawn of Prophecy and Queen of Sorcery), Anne McCaffrey’s Dragonflight, and Patrick Rothfuss’s Name of the Wind. Introduction: What is Fantasy and what is it good for? Course artwork adapted from “The Towers of Valyria” by Ted Nasmith. Used with permission. All rights reserved.